Our Vice Chair Jonathan Lutwyche and his colleague Alex Paul have teamed up with Taro Ishikawa, General Manager of JEMAI to climb Mount Fuji raising money for the youth teams of the Bradford Bulldogs Ice Hockey Club. 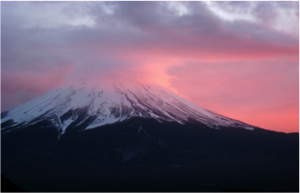 The Mount Fuji Challenge forms part of the strengthened partnership with JEMAI (Japan Environmental Management Association for Industry), The REACH Centre’s new chemtrac agent for Asia. The REACH Centre and chemtrac have a long history supporting the Bradford Bulldogs’ activities for children. The Bradford bulldogs are a team of dedicated volunteers who organise and coach Ice Hockey in the English Ice Hockey Association leagues at Under 10, Under 12, Under 14, Under 16 and Under 18 levels, committed to providing access to good quality coaching and access to Ice Hockey for all young people. They believe that their young players are going to be the future of UK Ice Hockey with the next generation of UK Ice Hockey professionals, players and coaches likely to be sown at this level. This year. more than 50% of the Bradford Bulldogs players represented the Northern Region of the country at National conference level, and 40% of those players represented England.. The money raised by the Mount Fuji Challenge will ensure the ongoing success of their youths’ teams by providing the players unique access to international coaching support and the future opportunity to participate in oversees exchange trips. Jonathan, Alex and Dr. Ishikawa are hoping to provide invaluable support in helping to achieve the targeted £20,000 required take the young players to the next level and thereafter potentially be afforded the opportunity to play professional ice hockey both in Europe and North America. If you want to help raising money for the Bradford Bulldog’s International Development Fund please complete the form below.